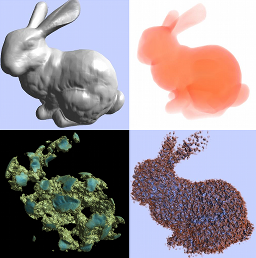 You can use GigaVoxel s renderer in GLSL but full GigaVoxels - especially the dynamics allocation, production and loading - is based on the Nvidia CUDA library. You will need a Nvidia graphics cards : at least a Fermi with a compute capability 2.0 and Cuda >= 7. GigaVoxels/GigaSpace is available on Windows (W7 or more) and Linux (Ubuntu 14 or more). - Go to download directory. - Linux : use updateXXX.sh scripts in the install directory. Access to the forge svn. or launch individual demoXXX.exe files from the prog directory. NB: defaults values or side effects in GvViewer can be missleading. And some tutos differ by the programming approach more than by what you see. So, do have a look on the manual ! GigaVoxels has been developped during the PhD thesis of Cyril Crassin (granted by the French Research Ministry via Grenoble University), under the advising of Fabrice Neyret (CNRS). Many other partial fundings and human participants have help or experimented directly or indirectly. Engineers (Morgan Armand, Pascal Guehl, Jeremy Sinoir, Paul Gannay), practice students, co-authors of the various papers, collegues in labs of companies with precious advices, and peoples from various INRIA support services... Thanks to all of them !